# Villa 47 has opened on Bree Street, with Locanda restaurant on the ground floor. Stuzzico Italian finger-food and bar has opened on the second floor. Cool contemporary The Restaurant at Villa 47 on the third floor has opened, with an Asian touch (photograph). # Burger & Lobster has opened on Bree Street. # The Stack has re-opened as a restaurant and members’ club, after stunning renovations due to fire damage last year. # Chef Jan-Hendrik van der Westhuizen of one Michelin star JAN restaurant in Nice could open a restaurant in Cape Town! Chef Jan-Hendrik’s first step is to host occasional dinners at his Higgovale home. # Chef Luke Dale-Roberts opened Naturalis as an ‘incubation hub’, for lunches, and a venue for occasional dinners and events. (NOTE: Naturalis is currently closed for lunches, and will re-open as a Wine Bar in the evenings when it has received its liquor licence). # Melissa’s has opened in Franschhoek, and is to open in Camps Bay. # Charango Grill & Bar Peruvian restaurant is to become a franchise operation. # Chef David Higgs’ 250-seater Marble restaurant in Rosebank in Johannesburg, with business partner Gary Kyriakou, has finally opened! Chef Werner Spöhr has joined them, as has Wikus Human, the Wine & Associate Manager. # Tiger’s Milk has opened in the SanClare Building in Claremont, in Century City, and is opening in Stellenbosch, in Bryanston in Johannesburg in September, and in Dubai. # Mon Desir has opened in Hermanus. # Restaurant Jardine has opened in Stellenbosch, the kitchen headed up by Chef Brendan Thorncroft, owner Chef George Jardine alternating between the new restaurant and Jordan Restaurant. # Dunkin’ Donuts will open 250 outlets in our country, the first four in Cape Town. 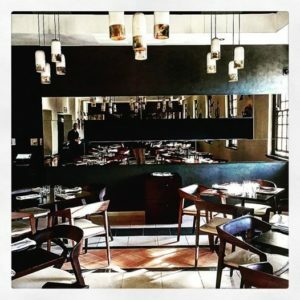 # [spasie] Upstairs has opened on Bree Street, as an art gallery and cocktail bar. # Baked Bistro has opened on Regent Road in Sea Point. # La Colombe Executive Chef Scot Kirton and Pastry Chef Glen Williams have opened an additional more informal restaurant Foxcroft, at High Constantia. # Idiom Wines has opened its new Restaurant and Wine tasting room. # The Catch Fish & Chips has opened in Hout Bay. # Chef Ivor Jones has teamed up with Chef Liam Tomlin, to open a second Chef’s Warehouse at Beau Constantia wine estate. # Easy Tiger has opened in Kenilworth. # The Salt Yard restaurant has opened in Mowbray. # The Harbour House Group has taken over The Grand on the Beach, and has re-opened. # Three Wise Monkeys Izakaya and Ramen Bar has opened on Regent Road in Sea Point. # Unframed Ice Cream Parlour has opened on Kloof Street. # Tre Steampunk Club Restaurant and Bar has opened. # Chef Bertus Basson is opening new restaurant Spek & Bone off Dorp Street in Stellenbosch. # Villains Pub and Ale House is to open in October. # Baconville is to open in Willowbridge in November, a second restaurant by Richard Bosman. # Black & Co will open in Constantia as a coffee and gift shop. # Pikant has opening at Uitkyk as a pop-up restaurant, operating until 29 January. # The restaurant at Glenelly has opened, with Chef Christophe de Hosse. # Rafiki’s has closed down. # Tuscany Beach in Camps Bay is closed for renovations. The new restaurant The 41 will open in October. # The Nunnery has closed on Bree Street. A new bar The Station will open. # Mimmi to Go in Hout Bay has closed. # Chef Conrad Gallagher appears to have closed down Café Chic and have left Cape Town! He is reported to have opened a restaurant Gallagher’s on Stanley in Port Elizabeth, despite not having paid suppliers in Cap[e Town! # Baked Bistro Bakoven has closed down. # Orinoco on Bree Street has closed, said to be reopening elsewhere next year. # Reuben’s Franschhoek will move to new premises, and its past space is to become a Woolworths. It has closed for renovations, and reopens at its new location at 2 Daniel Hugo Street in March 2017. It will operate as a pop-up restaurant at the Riffel-owned Racine at Chamonix. # Chef Liam Tomlin is on a major expansion spree. He is taking over and renovating the former Takumi space as an Indian tapas bar, on two floors, opening in about three months. His chef Sheldon Raju will head up Thali restaurant, and the project partner is Dimo Papa Christodoulou of Fat Cactus and Long Street Cafe. They will not take reservations. # Chef Warwick Taylor, ex-Creation, has opened SOURCE restaurant in Hermanus,where Season and Biga used to operate. # The Village Tart has opened where Gideon’s Pancakes used to be in Franschhoek. # The Creamery is to open in Claremont. # OpenWine Taste Pair Shop has opened on Wale Street. # Five Rooms at the Alphen Hotel has been transformed into a contemporary art gallery restaurant blanko. # Orinoco is closing at its current premises on Bree Street on 15 October, and reopens next year at an as yet unidentified location. # The Grand Camps Bay will open as La Parada at the beginning of November. # La Tête is to open where Orinoco operated on Bree Street. # Leopard’s Leap Culinary Manager Martell Smit has left Leeu Estates. # Marie-Louise Oosthuizen has moved from Café BonBon to Leopard’s Leap as its new Culinary Manager. # Chef Thomas Sinn has left Rivendell Restaurant, exploring new opportunities. # Calim Anderson is the new Chef at Equus at Cavalli Estate. # Chefs Scott and Mel Shepherd have left Le Franschhoek hotel, and have moved to Café BonBon. # Isabella Immenkamp has left Hoghouse at Spier. Andre van der Merwe has taken over as manager. # Martell Smit has left Leeu Estates, and is the Manager of the new Melissa’s in Franschhoek. # Massimo’s is now open for Lunch and Dinner Mondays to Sundays. # The Test Kitchen closes for six weeks from 15 August, reopening on 10 October for Dinners only, for extensive renovations.